Brisk walking provides immense health benefits, if practiced the right way. It goes without saying that if the technique is not right it may lead to unnecessary injury and exertion. 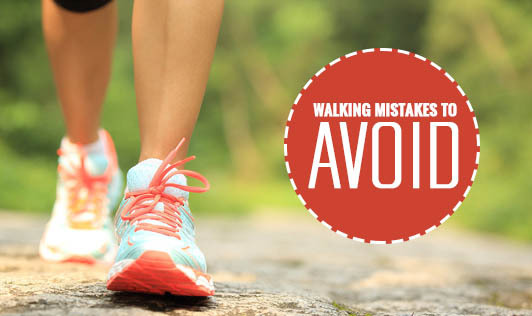 So here are some pointers to keep in mind while you take your next walk. Avoid Over-Striding: Make sure you take short and quick steps as taking longer strides will put a strain on your back eventually. Use the Right Shoes: When you walk for a while, your feet tend to swell. To accommodate it make sure you invest in a proper pair of walking shoes which is flexible and sized right. Avoid Walking Flat-Footed: Try to make your forward step starting from heel to toe and aim to roll over your next step. To make it easier for you, get a pair of running shoes with low heels and spend some time to strengthen your shins, ankles, and lower legs. Use Your Arms Wisely: It is neither advisable to keep your arms hanging on the sides nor is it recommended to keep them without movement. Bend your arms at 90° angles and swing them back and forth, opposite to your leg movements. Keep your elbows close to your body. This will give power during your walk. Maintain Good Posture: A good posture ensures you get maximum benefit out of your activity. Make sure to keep your chin up, parallel to the ground and focus on the street approximately 3 to 6m ahead. Avoid leaning too far backward and forward. Make sure your shoulders are relaxed and your back maintains a natural curve. Choose Suitable Attire: Clothes do matter. Wearing too much or too little may hamper your activity level. Hydrate Yourself Well: Make it a habit to drink water before, during, and after your workout. Additionally, drink a glass of water for every waking hour throughout the day. Avoid Overtraining: Take a day off if you feel you have aches and pains or feel tired and irritable. Taking a break may rev you up again! Walking is an excellent way to strengthen muscles and work up the heart rate. It can give you immense energy and stamina to keep you going through the day and stave off stress as well. Therefore, begin walking today for a healthier tomorrow.